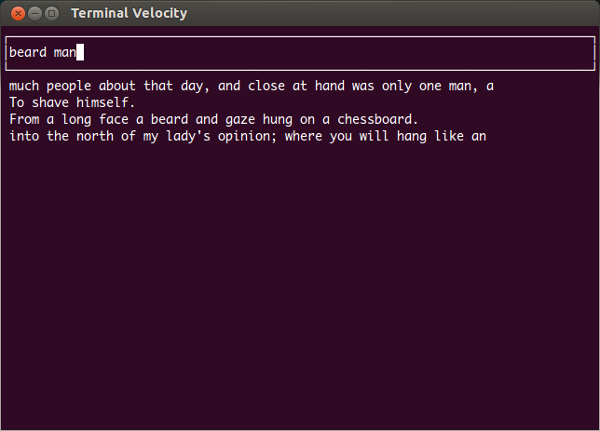 Terminal Velocity is a fast, cross-platform note-taking application for the UNIX terminal. It focuses on letting you create or find a note as quickly and easily as possible, then uses your $EDITOR to open and edit the note. 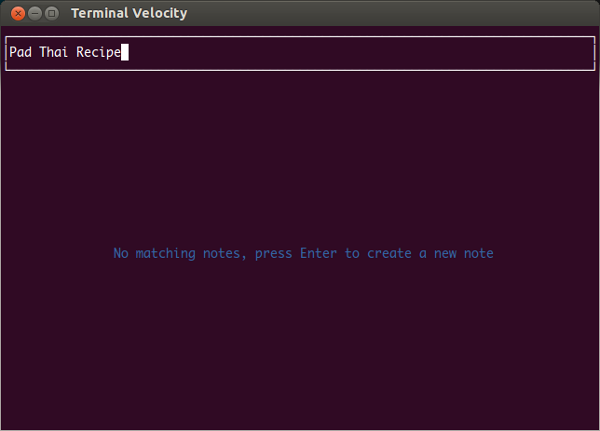 Disclaimer: Terminal Velocity is heavily inspired by the OS X app Notational Velocity. To quit the app, press ctrl-c or ctrl-x. To create a new note, type a title for the note and hit enter. The note will be opened in your text editor. As you type the title, the list of notes filters to show notes that match what you've typed, giving you a chance to open a related note instead of making a new one. The same text area is used for entering the titles of new notes and for searching notes. To find and open a note, type some words from the note's title or contents. The list of notes filters as you type to show only matching notes. When you see the note that you want, use the up and down arrows to select it then hit enter to open it. You can also use page up and page down or mouse clicks to select notes. If you type the beginning of a note's title (case-insensitive), that note will be automatically selected in the note list and its title will be autocompleted in the search box. Whenever a note is selected, just hit enter to open that note. If you want to create a new note whose title is a substring of an existing note's title, then even after you've typed the full title for your new note the existing note will still be selected by the autocomplete. In this case, you have to hit ctrl-d or escape to clear the autocomplete selection, then hit enter to create your note. Since your notes are just a directory of plain text files, it's easy to sync them using Dropbox, Ubuntu One, Unison, git, etc. Just use a notes directory in your Dropbox or Ubuntu One directory, in a git repository, etc. Notes are kept as plain text files in a notes directory (~/Notes by default). Notes are sorted by modification date, most recently modified at the top. The search is fuzzy. A note will match a search term if it contains all of the given search words anywhere in its title or body, the words don't have to appear consecutively or in the same order. The search is smart-case. For each search word, if the word is all lower-case then it will be matched case-insensitively. If the word contains any upper-case letters then it will be matched case-sensitively. You can have note files with different filename extensions. The --extensions option tells Terminal Velocity which filename extensions to recognise as note files, the --extension option sets the extension to use when creating new notes. Terminal Velocity doesn't support renaming or moving notes yet, but you can move note files (and edit their contents) using other tools, this will not interfere with Terminal Velocity as long as you don't do it while Terminal Velocity is running. User interaction copied from Notational Velocity. Some code snippets ideas borrowed from Andrew Wagner and Simon Greenhill. Written in Python using Urwid.